This training nurtures the creativity of the performer and places the actor at the centre of dramatic creation. We are practitioners who teach. The techniques we share at the Actors Space have been developed from over 50 years of combined professional experience as actors, directors and teachers. We offer hands on physical theatre and screen actor training which at it’s core, is inspired by working with Jacques Lecoq at his international school in Paris. What is essential in the training is to get the participant to engage with ‘Le Jeu’ (or ‘Play’). Lecoq defines ‘Le Jeu’- “When, aware of the theatrical dimension, the actor can shape an improvisation for spectators using rhythm, tempo, space and form”. ‘Play’ is connected with making the most of any particular moment dramatically. It is about rendering the moment fully into life on stage. To achieve this the actor has to train their body, imagination and creativity. We do this by exploring the actors dramatic presence and the nature and dynamics of conflict; The push and the pull, contraction and expansion, crescendo, rhythm, space, complicity, etc… The work focusses in like a micro scope to reveal the essence of dramatic situation and the interplay of the forces involved. This is what we call the ‘dramatic motor’. 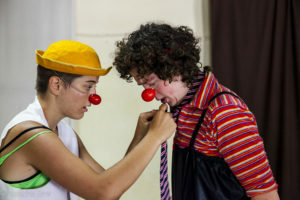 With this connection and awareness of the motor of a scene the actor is free to play. Also, we ask the question “What do you want to say”? To develop style with no content is a fruitless act. We encourage artistic risks to be taken and together we seek poetic depths to be explored. We are after all creating work that mirrors life itself. Ultimately our aim is to empower the actor to create meaningful work. We do this by developing their understanding of all the elements involved, the writing, direction and acting. We call this the ‘creative triangle’. Marian Masoliver (Spain) and Simon Edwards (UK) met in 1989 while studying with Lecoq in Paris. After 20 years of professional experience as actors and directors touring around the world they established The Actors Space. This year they are celebrating the 20th anniversary of this international theatre and film centre. The famous three Actors Space rules ‘enjoy. enjoy, enjoy!’ have become synonymous with everything they do and resonate with everyone who they have taught. Along with their own theatre and film creations, Simon and Marian have provided specialist training for actors, theatre companies, performing arts colleges, universities and theatre schools all around the world. Find out more about your teachers, their approach and their work: Simon and Marian. ”Error is not just acceptable, it is necessary for the continuation of life, provided it is not too great. A large error is a catastrophe, a small error is essential for enhancing existence. Without error, there is no movement. Death follows”.